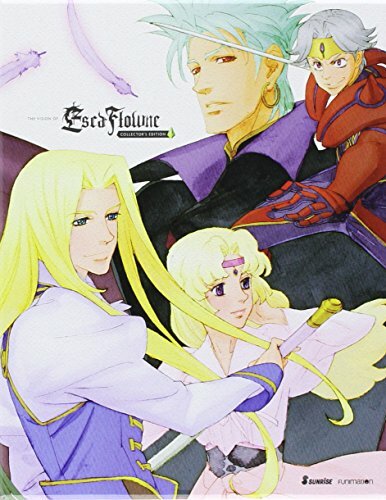 A sweeping tale of love and war, The Vision of Escaflowne was a seminal series that influenced anime s worldwide popularity. Directed by Kazuki Akane, this beautifully animated adventure features epic music, memorable characters, and an unforgettable love story. Hitomi Kanzaki is an ordinary high school girl who runs track and has an affinity for tarot reading. But when a brash young man named Van appears from a beam of light at her high school, Hitomi is spirited away to a myserious new world called Gaea. On Gaea, Hitomi is a stranger in a strange land. Soldiers in magnificent armored mechs, or Guymelefs, wreak havoc around her. Humanoid animals walk and talk like people, and foreign empires are embroiled in an increasingly violent war. On top of that, Hitomi discovers her ability to read tarot cards is due to a secret power more potent than she d ever imagined, and her newfound ability makes her both an asset and a target. To save the world of Gaea and return to her own, Hitomi must unravel the mystery of her powers, Van s past, and the powerful Escaflowne. The Collector's Edition comes in a collectible box with an art book.